Bestselling author Jordan Rubin, with David Remedios, M.D., shows how to adopt the 7 Keys in The Great Physician's Rx for Health and Wellness to focus aggressively on diabetes and develop a game plan against it. 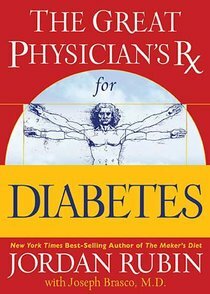 About "The Great Physician's Rx For Diabetes"
Jordan Rubin is the author of the New York Times bestseller The Maker's Diet with over 2 million copies in print. His story and his previous books have been featured on Good Morning America, NBC Nightly News, Fox and Friends, and Inside Edition, and in USA Today, Time, and Newsweek. Jordan also founded the Biblical Health Institute to empower the church to live the abundant life that glorifies God. - Publisher.